D a n c e s W i t h W o o l: Six years! Yes, you were right! Six years of blogging. It does seem a long time. It is kind of humbling to look back as there are many, many posts that should never have been published, some that I just bare to look at again and just a few that were worth putting out there... I try to look at them with gentle eyes. Few times over the years I have wanted to write my final post, not because I have hated the blog but because of not having anything to write or say and thus knowing that I have been a disappointment to those of you who have been coming over to see the same old post. But I am really glad that I am still here and most of all, happy that you are still here! Thank you! I have been twice to Facebook, first time to make myself a profile and the second time to remove it. I have never been to Twitter and don't quite know how it works. But I love Ravelry! Sometimes I think that I should get to know Twitter and one day might do so, but there are just so many hours in a day and for the time being, I am committed to keep the blog alive. I thank you for your encouragement for me to write a book, and few times over the years I have thought about doing so... but there are few strong reasons why I have not yet. I am not saying that I am not doing it at some point but so far these are my reasons for not to. First of all, I am not a writer. I know that with hard work one can overcome obstacles but also I suspect that lots of skills, that I am not even aware of are needed for making a book worth publishing. I am sure it would be so much work that I would not be able to keep up this blog for a long time and since I started this to be connected to the world I would hate to abandon this for such a long time. The third reason is that I lack the inspiration to write one, I would really need to find a fascinating topic (in knitting) that would inspire me even after fortnight's worth of sleep. I know inspiration is just the beginning and hard work follows it, but one needs to have a good basic idea to build on. (Maybe with time I will come up with one...) So, this is where I am at the moment. I have never sold my illustrations but in the future I hope to be able to work more hours with the pen and maybe then I can come up with a way to spread them a little. But in the meantime, I will publish one every now and then here. Happy Blog Anniversary we are all so happy you are here in blog land writing when you can. You are an inspiration and your knitting is amazing. You are always very self-effacing and humble, which I admire about you, but honestly your blog posts are so good that it is of no concern to me how long you take between them. When they come up I am delighted and read them right away. There are very few bloggers I can say this about. Nevertheless, no matter what you do, a late congratulations on your blogiversary and many thanks for all that you choose to share with us! Thank you for sharing your work for 6 years, whether it's knitting, illustrations or inspiration. It is always a pleasure to read, and to see, what Lene has to show. I have been reading your blog for about four of your six years, and I don't think I have commented before, but I enjoy it so much. During the same four years I have been able to move away from patterns and trust my own knitting knowledge and ideas more and more, and your blog is always encouraging and inspiring in that way. And, I have always felt that in my bones I am a "northern" person, so I love to imagine living where you live. Thanks for your continued blogging! Happy anniversary, Lene! If you ever do write a book, I'll be at the head of the queue to buy it. I enjoy reading your posts and seeing your life near the Arctic Circle. Keep up what you do best. Lene, I simply love reading your blog! I have followed it faithfully since it began six years ago, and I still smile when I see that you have posted a new entry. You are lovely in print - and, I am sure, in person - and your writing about where you live and what you do makes me hope against hope that we might meet in person some day. You seem to be a kindred spirit! Please keep writing - yes, about knitting, this from one passionate knitter to another - but also about creativity, family, and life! I have enjoyed your blog for many years now, am always excited to see an updated post. Your needleworks, illustrations, and descriptions of your surroundings are interesting and enchanting to me - thank you for sharing! I almost never comment on blog posts, but I just had to write something. This is my favorite knitting blog. I love the care you take to get each of your knits and other fiber work just perfect. It is obvious that you put a little bit of yourself into each one. I also love your prose. You may not think you are much of a writer, but your words convey so much care and love and joy. Happy blogiversary, and thank you for sharing with us! Happy Bloggiversary from me, too! I love the gentle, quiet tone of your blog whatever you write about, and am always in awe of your knitting whenever you include photos. My "social networking" history mirrors yours exactly; give me blogging and Ravelry and keep the rest. 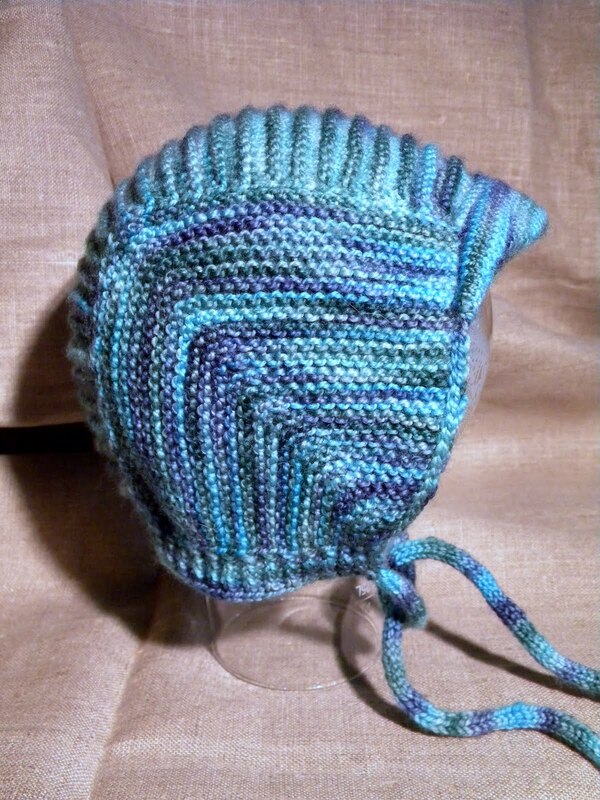 I love, love, love that little hat and look forward to the pattern, if you're ever going to write it up! I love that little bird is holding a stitch marker. He is so very cute! I have read your blog for nearly that length of time and I always read each post eagerly, no matter how often you write. I love your care and attention to detail, and the beauty of your knitting, and the applique you do as well. I've never commented before, but I have to say that I want you to keep writing, as much or as litle as you want, and there will be people like me always happy to hear what you have to say.Thankyou! Happy Blog-anniversary! Like the other commenters, I, too, am an admirer of your work, the way you see things, and I am always inspired after after reading your posts. Never have I been disappointed. PS I'm not a member of Facebook or Twitter either! And Ravelry is wonderful, isn't it? What everyone else has said!!! Dear Lene, not one of your posts has been a disappointment. Always there is something that either brings a smile, inspiration, or resonates within my heart. What you write about not trying to write a book makes sense. You've obviously put a great deal of thought into this. You are gifted and yes, you could write a book but being able to do something does not mean one must. The baby cap is very sweet. Writing patterns is a bear but I do how you will write it up and publish it. I am glad you decided to go on with your blog. And since you just write a post now and then they become even more precious to us, or at least me. I know blog writers who write two posts a day and.. well, sometimes I think they have less worthwhile things to tell the world than you do. Just remember the you-know-who in the woods in August. That was just awesome to read. Like everyone else, I check your blog every day--your very poetic way of writing about your adventures with fibre and your surroundings (and the animals!) make my mornings very special. And you are always worth waiting for! I love that little hat. As I do all your knitting. Happy Blogversary. Congratulations Lene! Thanks for sharing your knitting and inspirations with us! Thank you so much for six years of beautiful writing and wonderful pictures, both of your illustrations and of the world you live in. I have read your blog from its inception and always look forward to the next instalment, no matter the topic. Your knitting projects always inspire me. I look forward to your posts whenever they come, and wish you well in whatever further writings you decide on. Happy anniversary! 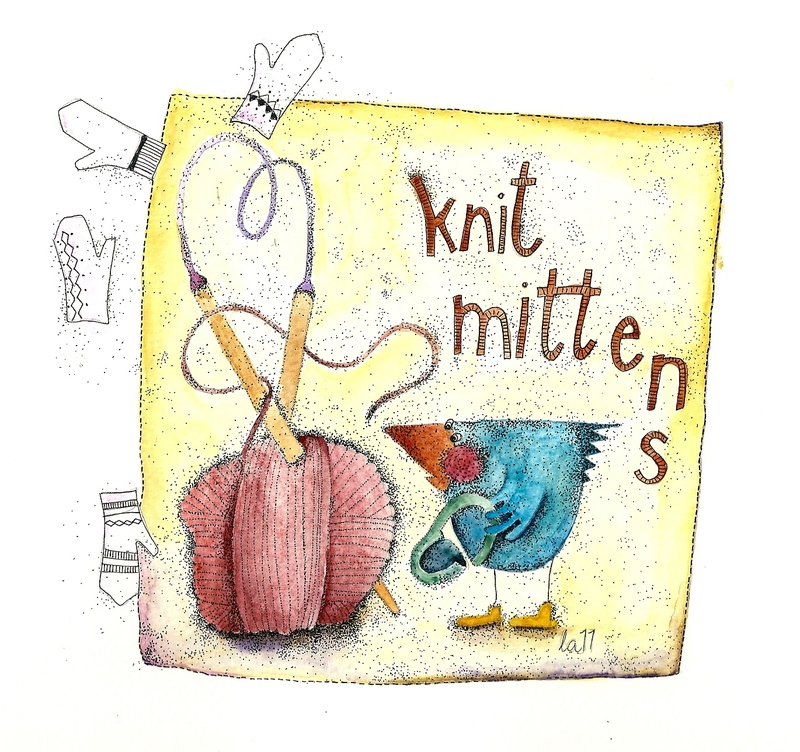 Love your mittens illustration! There are some bloggers who post every day and have nothing to say. I'm happy to wait for your posts...they are always interesting, frequently beautiful, often inspiring, always thoughtful. You have a unique voice among the blogs I read...I'd hate to think of it no longer being around. I'm a relative late-comer to your blog...have been reading for about 2 years...but I look forward to every post and have a little jump of joy when I see in my reader that you have a new one. I read and really enjoy your blog. I rarely comment though. I am today to just let you know that I hope you continue with your blog. I would really miss it if you stopped. Dear Lene, I have so enjoyed all of your posts for all of these years. I am sorry you don't like some of them, but I know that I am one of my worst critics, and I guess it is the same for you. But please, don't delete old posts; they are all so interesting. Thanks you for keeping on. And the long waits for a new post - well, you have other things to do besides entertaining the knit-blog-readers of the world. SOMEone has to do all those Lene-things! You can't spend all your days writing. I enjoyed your stories about weaving, winter blue, snowmobiles, reindeer, trips to other places, children, museums, lakes, dancing in socks (although I don't remember seeing a photo of this), dogs, housecleaning, Christmas, on and on. Best wishes to you and yours in the snowy dark months, and thank you for everything.